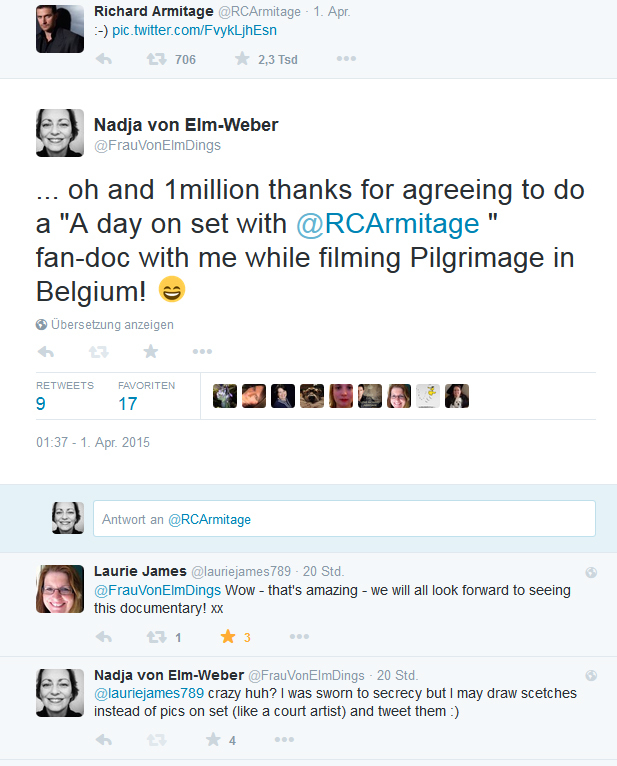 Idea occurred after seeing the first pics from the Pilgrimage set on twitter while Richard was still shooting Hannibal in Toronto. 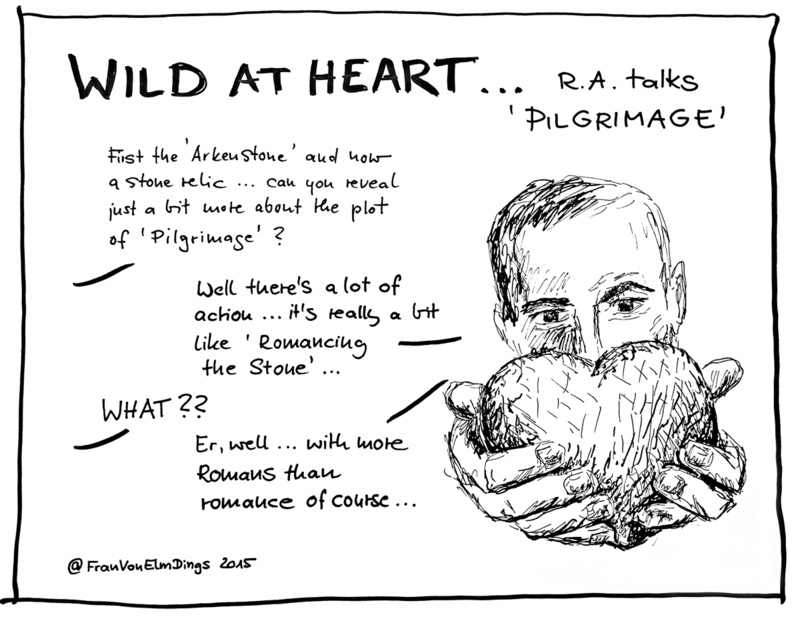 For German readers who don’t get the joke: the english title of the 80s movie “Auf der Jagd nach dem grünen Diamanten” was “Romancing the Stone”. Pimp your Fandom! The admiRAtion Bingo is here! 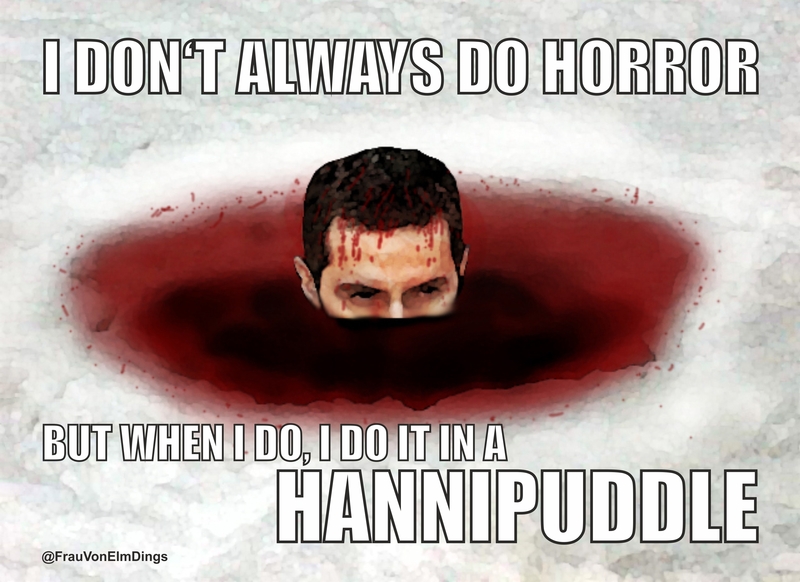 Bored by the same comments on every Richard pic on twitter? That must not be! 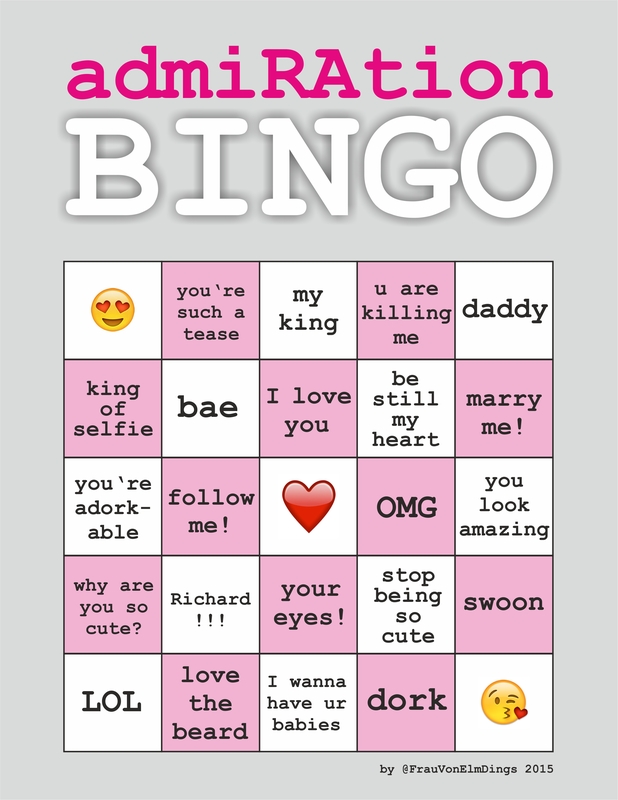 Print out this special admiRAtion Bingo sheet to be prepared for Richard’s next selfie tweet! Mark every comment you’ll find and just yell “LOVE!” when you’ve completed a row, column or diagonal and ignore any astonished looks – bring back the fun to the fandom! 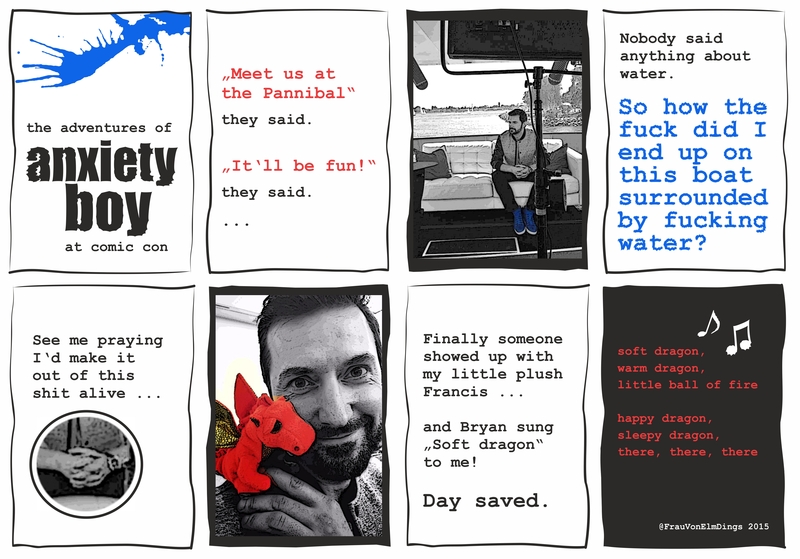 Original pics from @lorettaramos and @BryanFuller digitally edited by me. Once upon a time in a land far far away, a stack of trading cards sat on a desk, waiting to be signed. The actor who showed up to do the deed was in a bit of a silly mood that day, he even bit one of the cards taking a selfie with it, wondering “where ere be they found?”. At one point his goofiness got the better of him and he gave in to the feeling that the one thing moody looking Thorin might have craved for all along would’ve been a smoke. 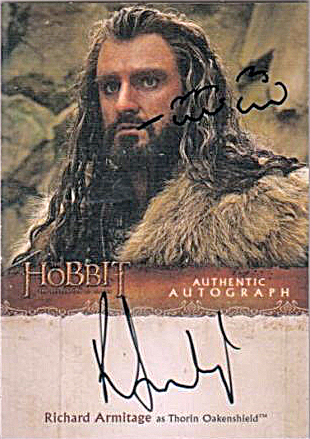 So he drew a ciggy and some smoke clouds on the face of the last little Thorin card. What he wasn’t aware of, was the fact that in doing so, he had worked some powerful chaos magic and thus the little card came to life. Crammed into a small pack with other cards, the little Thorin card then waited patiently in the dark for a very long time. But on some days he wished he wasn’t alive at all … the dead eyes of a Thranduil card were mindlessly staring into his back and right before him was a breathtakingly pretty but sadly equally lifeless Tauriel card. Crap. Would his whole life be like this? Maybe he would end up with a serious collector and buried alive inside a binder for all eternity? Or have some angry kids fighting about him and maybe tearing him apart in the process? The little card shuddered. But in that exact moment suddenly the light came back – someone had opened up his pack! His little card’s heart skipped a beat as he looked up into a very happy face. 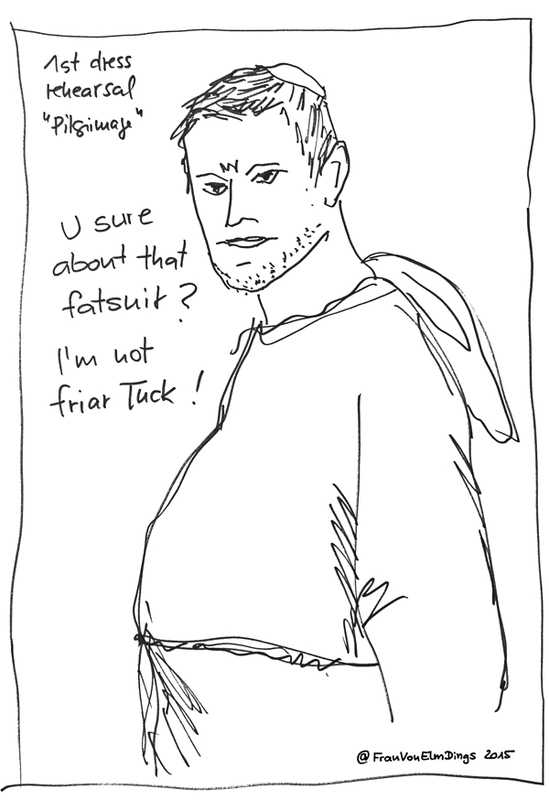 He heard his liberator whistling and shouting “Woah look, there’s an extra drawing on that Thorin! You’ll get me a lot of bucks little buddy!” … and his stomach turned – oh no! 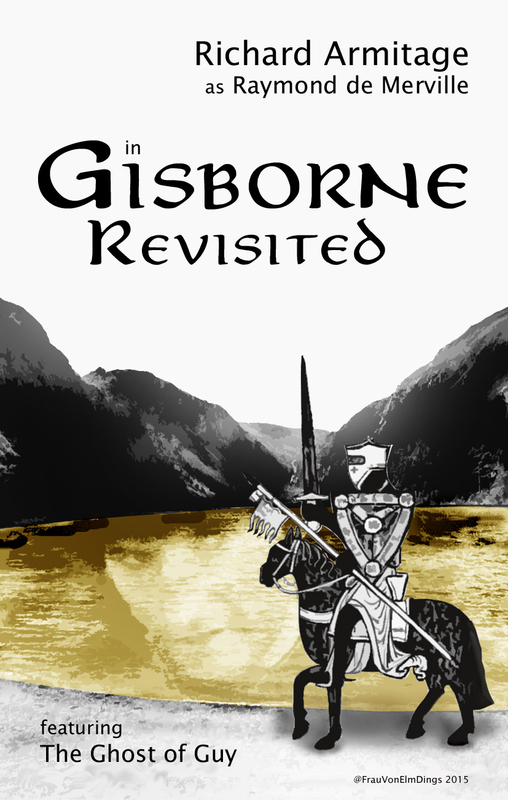 – he had fallen into the hands of a merciless merchant! Later on that same day – almost 4000 miles away – a fair maiden was checking her twitter account. Suddenly a commentary from someone she was following caught her eye “Armitage inflation: This is the most I’ve seen a signature card offered for yet” … after taking a look at the price tag of the small picture she found herself thinking “400 dollars or ‘best offer’? The world has officially gone mad”. 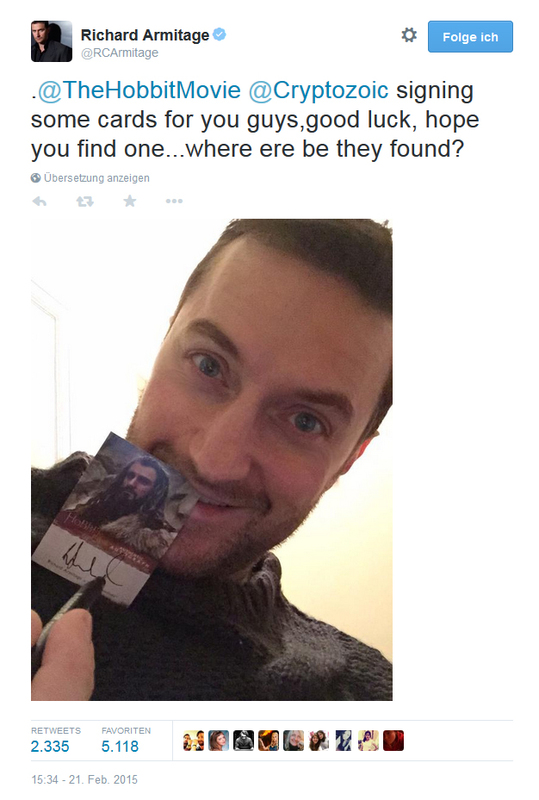 She followed the link to get to see the whole picture anyway and there it was: a little Thorin card – who was actually smoking a cigarette and … what was that? She had to rub her eyes and look again: there was no mistake – the card seemed to be rather alive and had now even winked at her twice! 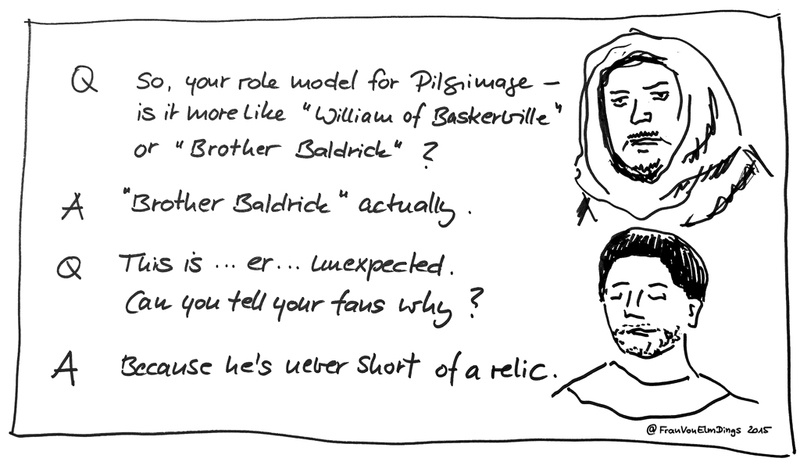 So the fair maiden decided to try and save the little Thorin card – on her own conditions. 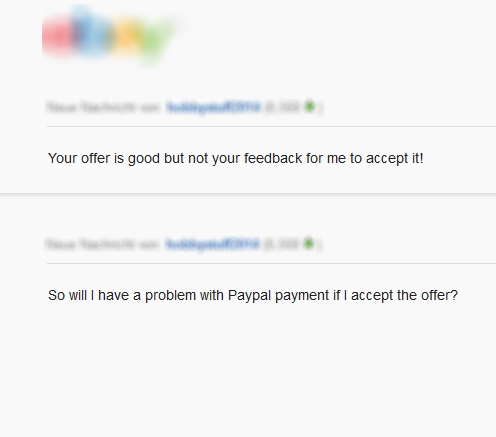 She set up an ebay account and made the merciless merchant an offer – she hoped – he couldn’t refuse. So the fair maiden had to stand up to the merciless merchant and virtually wield her magically Visa card to make her point crystal clear. After that he finally gave in and their whole deal even got the ebay fairy’s blessing, who covered for the shipping costs with a 10 dollar promotion code. 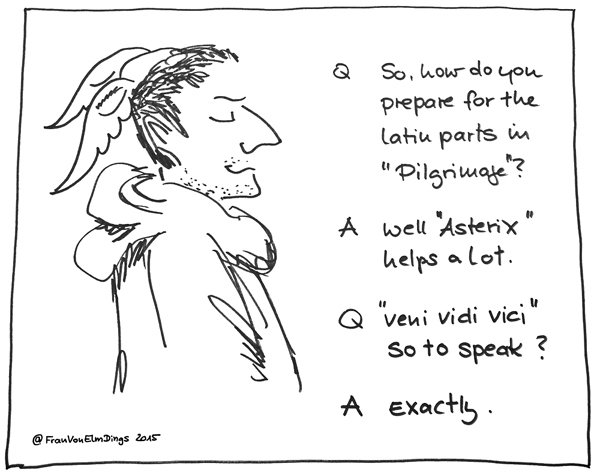 Now only one question remained: could the fair maiden trust the merciless merchant? 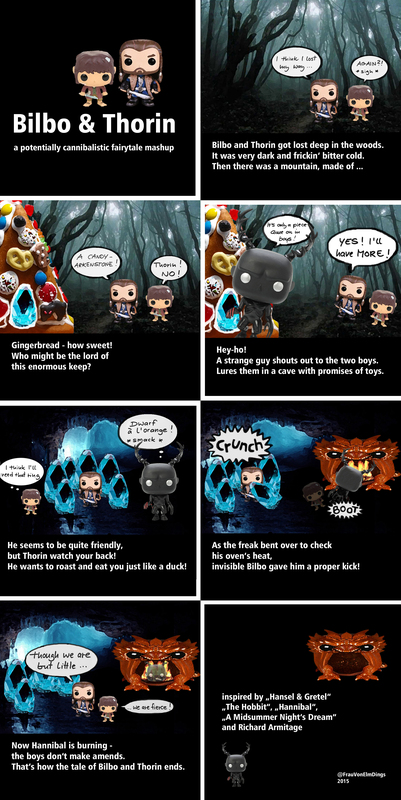 The little Thorin card was now on its own for the first time in his life. Travelling in a padded envelope – in the dark again *sigh* – he thought about the face he had seen briefly through the merciless merchants computer screen before he had been all packed up once again: a fair maiden with laughing green eyes and a somewhat stubborn streak. Not bad, he had thought and before he knew it, he had winked at her – twice. “Since when are we that flirty, eh?” he asked himself for the gazillionth time. The strange thing was, that he somehow felt, that she had really looked back at him. So maybe it was for the best. She didn’t seemed to be the type who would put him away in a dark safe place once she got him and that was the important thing. 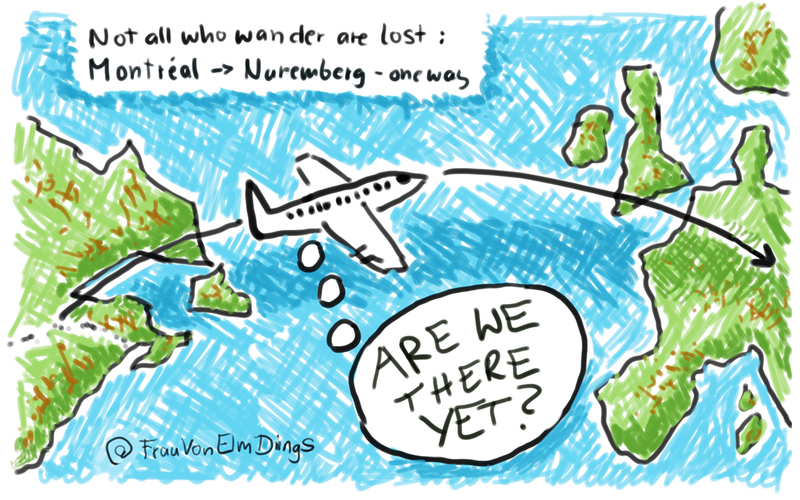 “Now why is this taking so long? Where on earth is this wench living? 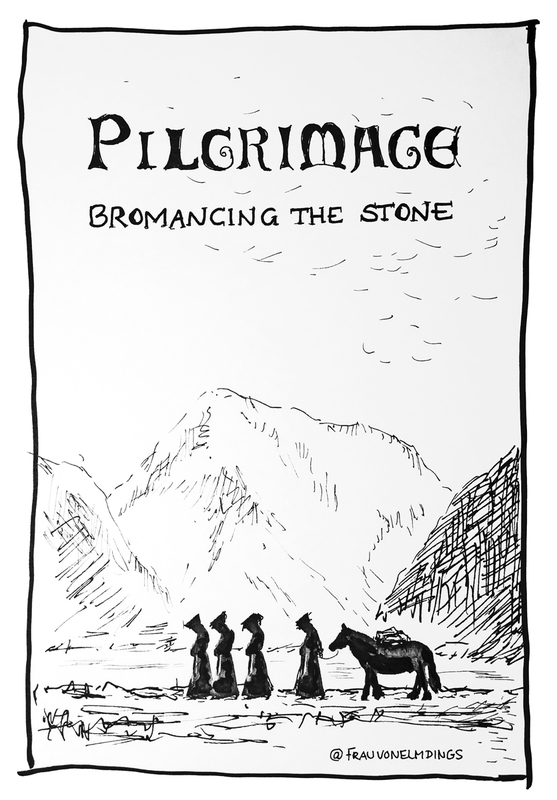 Beyond the mountains with the seven dwarfs?” … he giggled and took a deep drag. 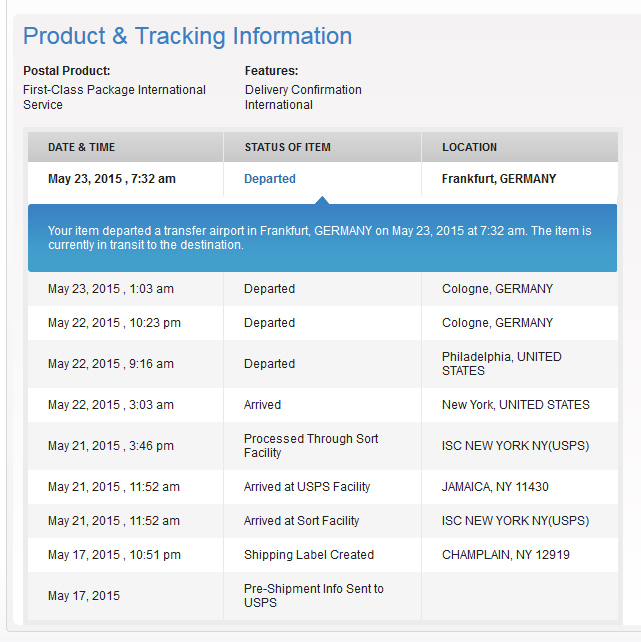 “Your item departed a transfer airport in Frankfurt, GERMANY on May 23, 2015 at 7:32 am. 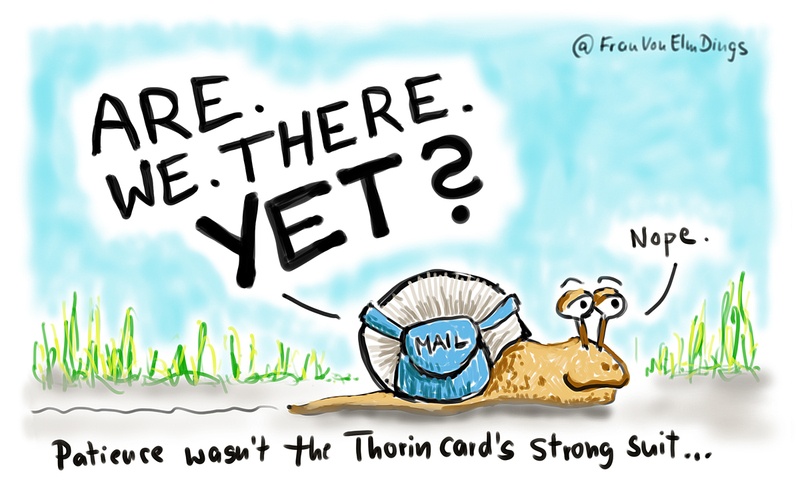 The item is currently in transit to the destination.” while the fair maiden kept tracking the little Thorin card’s long journey, itself was completely unaware of its whereabouts. Suddenly he heard strange voices shouting “Achtung! Achtung!” … this wasn’t sounding like English anymore. 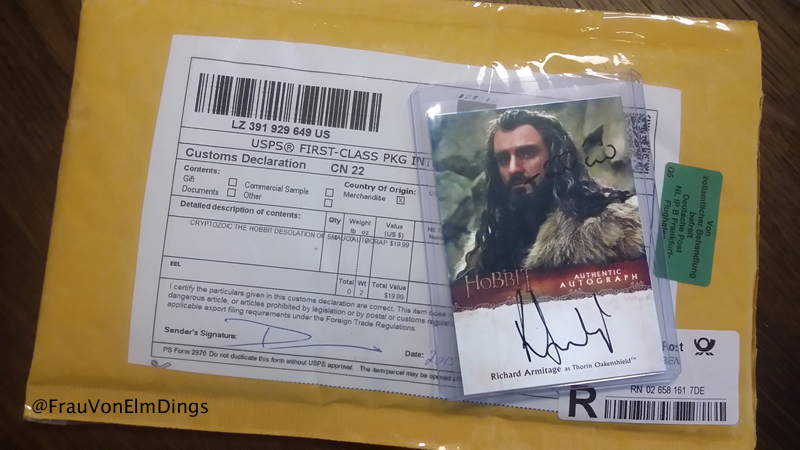 The little Thorin card was a little bewildered at first, but then the penny dropped “Holy sh**! It’s the Krauts! 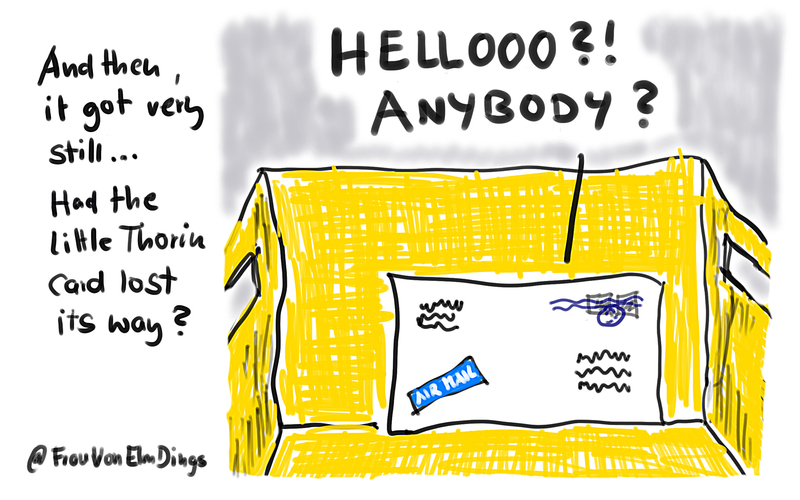 They always say ‘Achtung!’ … o.k. 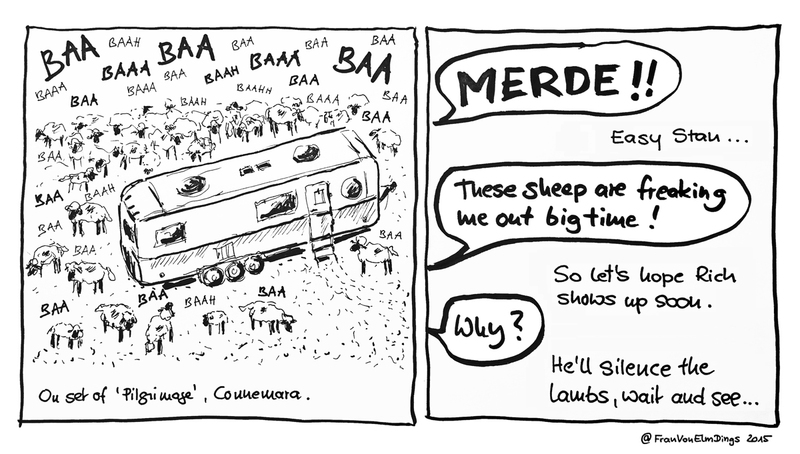 Thorin, seems it’s ‘Don’t mention the war!’ from now on.” he thought. 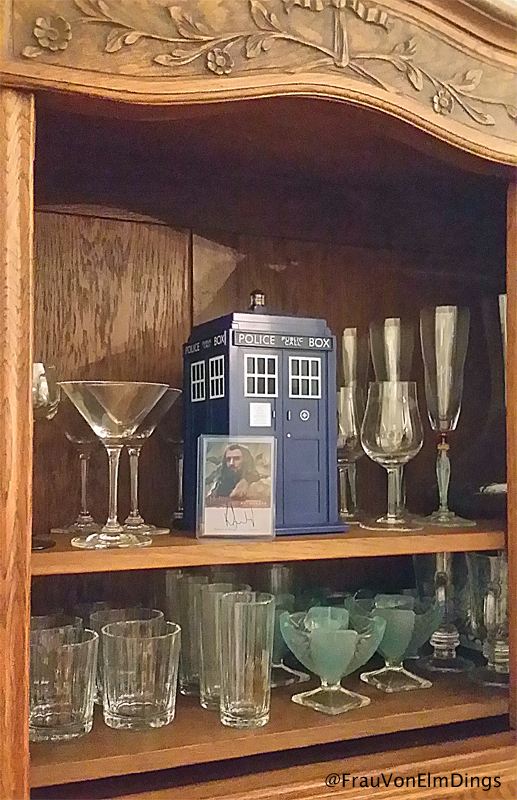 It took him not long to spot the Tardis in the cupboard! This was the very thing! 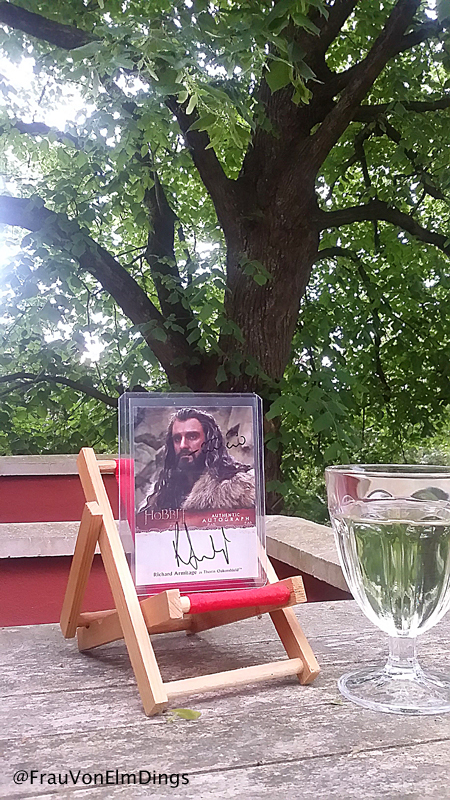 Now the little Thorin card was able to travel to all the places he’d always dreamt to visit! In the evenings he promised to join the fair maiden for her guilty-pleasure-once-a-day-smoke under the linden tree in the garden and tell her of his adventures in time and space. Sometimes she would read to him from strange German books and she always teased him endlessly by holding her wineglass under his nose. 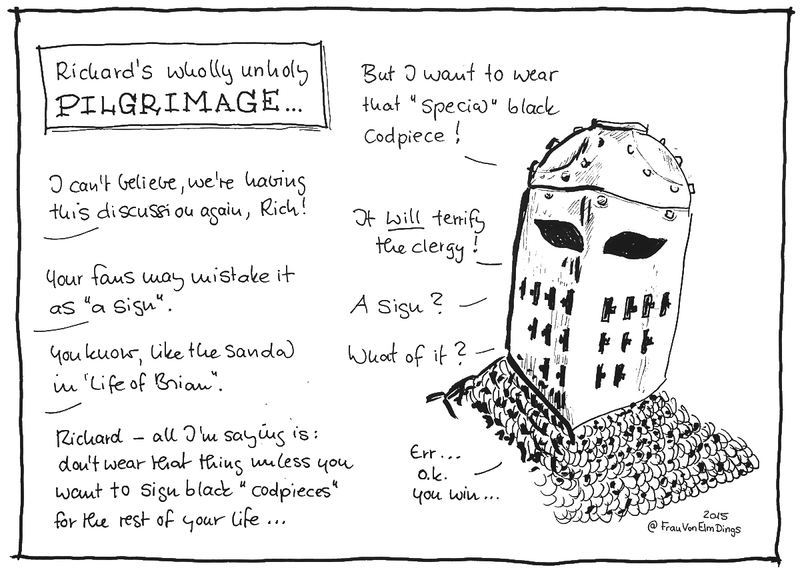 “Elbling” (Elveling) of all sorts! 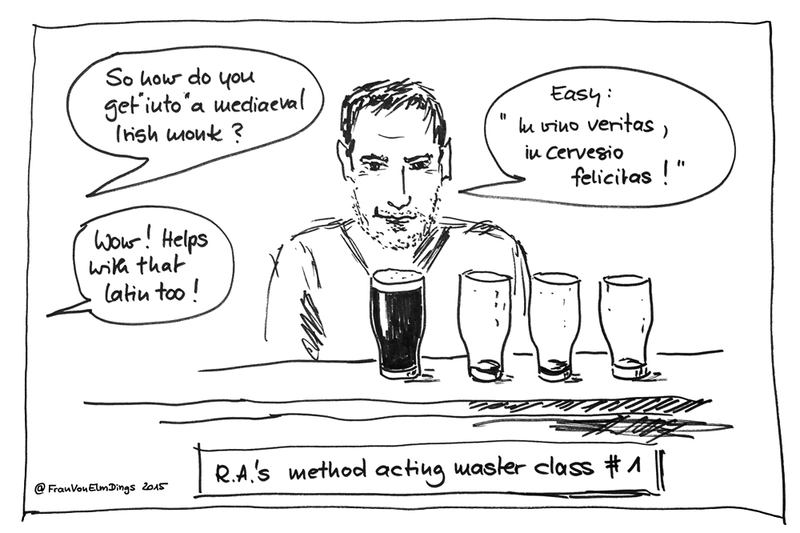 He wondered if he could somehow convince her to go and meet up with that actor, so he might draw a wineglass for him too?